There’s great big news in Middle Eastern food history. Persian cuisine — the most influential in history, deeply affecting the Arab world, Central Asia and Northern India — is shockingly all but unrecorded. Not a single cookbook has come down to us from before the 16th century. But now two Iranian scholars have just translated one of them, the Kārnāme (1521) — saving me the trouble, I’m glad to say. I wouldn’t want to stake my reputation on my knowledge of Farsi. So this is a very important book. It shows us many things, starting with the survival of the medieval sort of stew, lavishly flavored with fruits and spices, which could be incredibly complex — one recipe for runs nearly 2 ½ pages. There are also simpler home-style dishes and some modern names familiar from Indian menus: dopiaza and roghan josh. And there’s baklava. In fact, although the word is Turkic and one of the recipes explicitly connects it with a place in Turkey, this book gives the earliest written baklava recipes. They are (like those in Iran and Afghanistan today) rather laboriously fried, rather than baked, as the earliest Turkic recipes themselves might also have been. Amazingly, two of the recipes are stuffed with lentils, rather than nuts. (Though we think nothing of the Chinese dumplings stuffed with red beans.) A friend of mine who has contacts at the Topkapi Palace in Istanbul tells me there are centuries-old recipes for lentil baklavas there as well. The typical Persian bread has always been nān, baked in a tandoor oven, but in this book it is essentially supplanted by komāj, originally a sort of tortilla cooked either in the ashes of a fire or on a special pan. By the 16th century it had evidently turned into a substantial bread baked in a sort of Dutch oven set on embers with more embers on top, as for the traditional Basque sheepherder’s bread. Unlike tandoori nān, it could be stuffed, and it was — you had komāj-e beh, which is essentially quince dumpling (like apple dumpling), a sort of pie with a meat or nut filling, and the fantastically baroque qabuli komāj, which includes all these ingredients and more, including pastas. For that matter, this was a startlingly pasta-heavy cuisine. No fewer than 16 varieties are called for, from little soup noodles to big stuffed pastas. I have a few quibbles, because I like nothing better than a quibble. The authors have been misled by a dictionary entry to speculate that the Central Asian steamed dumpling mantu or manti was originally made from tripe. They think tutmaj, the name of a Turkic pasta consisting of sheets of dough, means “sumac stew.” And they don’t seem aware that the word āš is a food name of both Persian and Turkic origin, which explains why it sometimes means soup, sometimes stew, sometimes pilaf. The first part of the porridgy rice dish šilepalaw is not a (nonexistent) word meaning soft but shilön, the Mongolian name of this dish — basically the only Mongolian contribution to world cuisine. The book has a recipe for pomegranate āš and one for pomegranate-seed āš. The distinction is that the former is made from fresh pomegranate juice, the latter by reconstituting the juice of dried pomegranate. End of quibbles. A few notes on language: The translators live in sheep-raising New Zealand, which recognizes a stage between lamb and mutton called hogget (a lamb older than one year but with only two permanent incisor teeth), so many of their recipes specify hogget. Don’t worry, most of the lamb in our markets would qualify as hogget. Persian has a lot of loanwords spelled with the Arabic consonant qaf, which is a sort of k pronounced deep in the throat. In Farsi, though, it is pronounced as gh, a gargling sound a little like the Parisian r, so the translators have decided to render both gh and q as q. This is a neat way of doing things, but it means you’ll have to get used to seeing words you may know from restaurant menus such as morgh and gheimeh spelled morq and qeyme. They spell the voiceless equivalent of this sound as x, the ch sound as č and the sh sound as š. A word you may be used to seeing spelled with an o may appear with a u; so ghoreh, “sour grape juice,” is qure. All quibbles aside, though, this book is a most welcome addition. 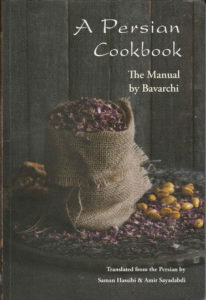 A Persian Cookbook: The Manual, by Bavarchi, tr. Saman Hassibi and Amir Sayadabdi. London; Prospect Books, 2018.